Ceremonies to commemorate the 70th anniversary of D-Day are drawing thousands of visitors to the cemeteries, beaches and stone-walled villages of Normandy this week, including some of the few remaining survivors of the largest sea-borne invasion ever mounted. World leaders and dignitaries including President Barack Obama and Queen Elizabeth II will gather to honour the more than 150,000 American, British, Canadian and other Allied D-Day veterans who risked and gave their lives to defeat Adolf Hitler’s Third Reich. For many visitors, the Normandy American Cemetery and Memorial with its 9,387 white marble tombstones on a bluff overlooking the site of the battle’s bloodiest fighting at Omaha Beach is the emotional centrepiece of pilgrimages to honour the tens of thousands of men killed on D-Day and the months of fighting afterward. A Hamilton mother whose son killed himself after serving in Afghanistan was devastated when she received a federal government cheque cut for him in the amount of one cent. But rather than wallow in pain after receiving the cheque last Friday, the couple set out to make sure it does not happen to other families. The minister pledged to take “immediate steps” to ensure “this never happens again,” and he also offered the Stark family an apology. “I extend the apologies of everyone in the government to his mother and we thank this individual for the service that he gave his country,” Nicholson told MPs. Justin Stark was a corporal in the Argyll and Sutherland Highlanders when he killed himself in his barracks on a Saturday evening. He was 22. He served in Afghanistan for seven months, starting in May 2010, after being associated with the military since 2006. His duties included patrols around Kandahar, where Canadians had their main base. But he said he had concluded Syrian government forces were behind a recent chemical weapons attack near Damascus. Speaking on US television, Mr Obama said the use of chemical weapons affected US national interests and that sending a “shot across the bows” could have a positive impact on Syria’s war. The UK had been pushing for permanent members of the UN Security Council to adopt a resolution which would have authorised measures to protect civilians in Syria. But Syrian ally Russia refused to agree to the resolution and the meeting produced no end to the diplomatic stalemate which has long characterised the UN position on Syria. The US State Department criticised “Russian intransigence” and said it could not allow diplomatic paralysis to serve as a shield for the Syrian leadership. Opposition parties accused Prime Minister Stephen Harper of dodging responsibility for the F-35 fiasco and said Defence Minister Peter McKay should be fired for allowing Parliament to be misled about cost overruns and other problems with the trouble-plagued $25 billion fighter purchase. “It’s absolutely scandalous that the Canadian government would intentionally provide information that they knew to be false,” NDP Leader Thomas Mulcair said after the federal auditor general released a report saying defence officials kept Canadians in the dark about cost overruns and production delays on the aircraft Ottawa plans to buy. The criticism mounted even as the Conservative government moved quickly Tuesday to quell the fallout from Auditor General Michael Ferguson’s scathing report, which includes the stunning conclusion that the fighters could cost $10 billion more than the defence department has publicly acknowledged. A Liberal motion calling for Ottawa’s Peace Tower flag to be lowered whenever Canadian soldiers are killed abroad was passed in the House of Commons Wednesday. The motion passed 142-115, supported by the Liberals and the NDP. 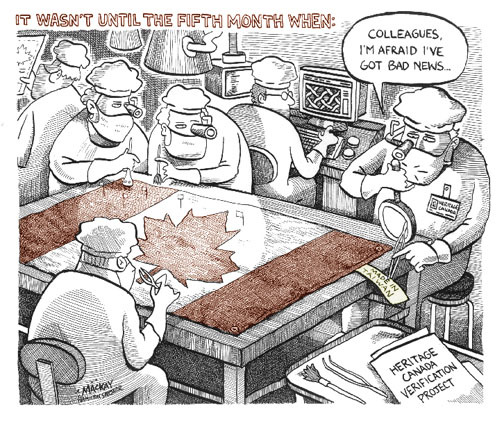 However, the Conservative government is suggesting it will ignore the non-binding motion and ask a committee to come up with a wide-ranging policy on when the flag should be at half-mast.Rather than lowering the national flag every time a Canadian soldier is killed, the Tories wants to put more emphasis on Remembrance Day, lowering the flag once a year in honour of all Canadian soldiers killed. MPs voted Wednesday on the Liberal motion that would require a moment of silence and lowering the Canadian flag on the Peace Tower for all dead soldiers, even as a report recommends cutting back on the honour. Jason Kenney, secretary of state for Multiculturalism and Canadian Identity, told CTV’s Canada AM on Wednesday that the current policy, which sees the flag lowered for every soldier’s death, hurts the flag’s status as a symbol of national pride. Royal Canadian Legion and other veteran’s associations, as well as many in the military, support the position, Kenney said. “If we had lowered the flag during the First and Second World War it would have never been at full mast, and so they say to us a country that’s in perpetual mourning can’t necessarily be a proud symbol,” he added. The panel — led by Robert Watt, Canada’s former chief herald — would restrict lowering the flag to mark the deaths of current and former representatives of the Crown, the prime minister and the Supreme Court’s chief justice. Kenney said the report recommends finding other significant ways of honouring Canada’s fallen soldiers. That could include lowering other flags at Parliament Hill, but not the main flag mounted on the Peace Tower. He also said it would be difficult to have to pick and choose when different groups request lowering the flag.